LOS ANGELES (AP) — Alan Alda will receive the SAG Life Achievement Award at next year's Screen Actors Guild Awards ceremony. "The Proposal." It was a 2009 movie starring Sandra Bullock, but now will forever be the informal title of the 2018 Emmys telecast, thanks to a memorable romantic gesture from Emmy-winning director Glenn Weiss — who summoned the courage to propose to his girlfriend on live TV. LOS ANGELES (AP) — Paul Junger Witt, the prolific TV producer behind "The Golden Girls," ''The Partridge Family" and "Soap," died Friday, a spokeswoman said. He was 77. Here's a new way to spice up a friendship. An online store called Always Fits, which describes itself as “a woman-owned, women-run business with a penchant for feminist gifts, gifts with a splash of profanity and colorful gifts,” has something special for fans of the hit show Golden Girls, Golden Girls Hot Sauce. MIAMI (AP) — One of four older elephants brought to Zoo Miami to live out their "retirement years" has died. Zoo spokesman Ron Magill tells local news outlets that Lisa, a 44-year-old African elephant, died Tuesday after lying down in her barn. She was part of the "Golden Girls," named after the 1980s television sitcom starring Betty White, Beatrice Arthur, Rue McClanahan and Estelle Getty. LOS ANGELES (AP) — Morgan Freeman will receive the SAG Life Achievement Award at next year's Screen Actors Guild Awards ceremony. The actors union announced Tuesday that Freeman will accept its highest honor on Jan. 21, 2018. LOS ANGELES (AP) — Television is paying tribute to Mary Tyler Moore, one of its adored leading ladies. Moore, who died Wednesday at age 80, will be the focus of broadcast specials. "Mary Tyler Moore: Love is All Around," is a new CBS News special airing 9 p.m. EST Thursday. Gayle King, co-host of "CBS This Morning," will anchor the salute to Moore's life and legacy. 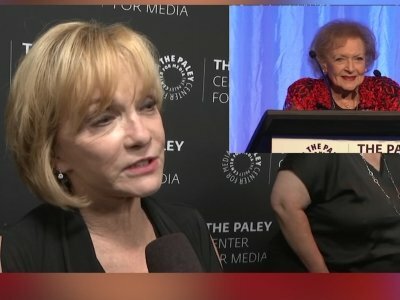 Betty White says the best thing about being 95 is that she's still employed. The actress is celebrating her birthday Tuesday. She tells Yahoo's Katie Couric that she's "most grateful" for still getting job offers. She says she appreciates "the fact that people have been so kind to me all these years." Following a string of celebrity deaths in 2016, a South Carolina man wants to be a guard for Betty White. Following the death of Star Wars actress Carrie Fisher on Tuesday, a South Carolina man wants to make sure White isn’t next. Demetrios Hrysikos started a GoFundMe page to pay for him to stand guard over the 94-year-old Golden Girls actress.